People may wonder what it is like to work at Make Headquarters. Well, as awesome as you’re imagining, it is actually even more awesome. Let’s take today for example. 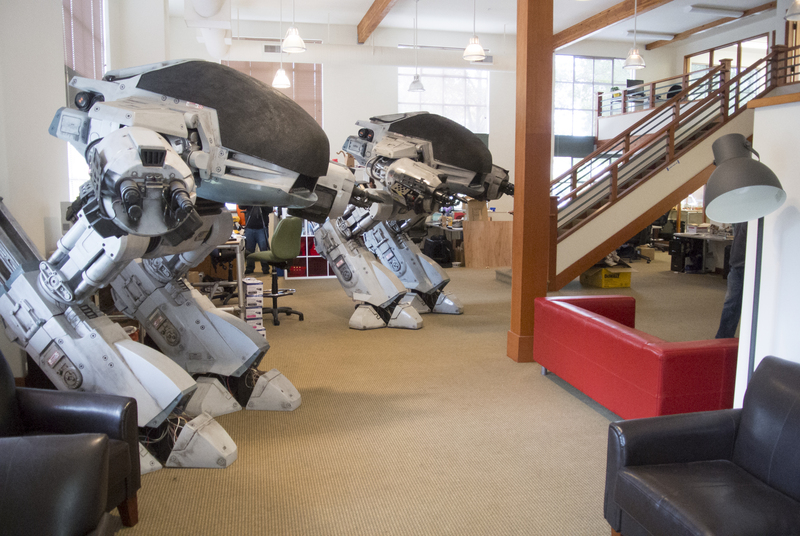 Today is not only Halloween, the ultimate maker holiday, but also the first time both ED-209 robots have been in the same place, at the same time. Somehow the world did not stop! When was the last time you arrived at work to find something as amazing as this had randomly arrived? Certainly, working at Make: is awesome, but today is a lot more awesome than normal. Check out the slideshow of the building of our latest coworker, a second ED-209. If you didn’t catch the whole how-to series by master maker Shawn Thorsson earlier this year, you might be wondering why we have such amazing things appearing in our office. Take a few moments to see how it was made, and dig in here to read the step-by-step tutorial series!